Pablo-WMDE updated the task description for T217399: Configure HTTP Request for mediawiki -> node service with custom UserAgent. Pablo-WMDE moved T218054: Add UA to node -> mediawiki requests from Tech (deprioritized tickets) to Ready for pickup on the Wikidata-Termbox-Hike board. Pablo-WMDE updated the task description for T218081: Log failed node -> mediawiki requests. Pablo-WMDE closed T213537: Apply new entity page mobile layout to error pages as Resolved. Apparently this healed itself (curtesy of minerva changes I assume). Pablo-WMDE closed T215890: Catch up with minerva header changes (id & star) as Resolved. Pablo-WMDE moved T215921: Configure helm chart from Backlog to Ready for pickup on the Wikidata-Termbox-Hike board. Pablo-WMDE moved T217035: Make sure SSR stops if client aborts transaction from Backlog to Tech (deprioritized tickets) on the Wikidata-Termbox-Hike board. Pablo-WMDE moved T217569: Enable publishing of SSR service to the Wikimedia Registry from Backlog to Ready for pickup on the Wikidata-Termbox-Hike board. Pablo-WMDE moved T218979: NPM Audit: get fixed braces version in direct deps from Backlog to Ready for pickup on the Wikidata-Termbox-Hike board. Pablo-WMDE moved T220404: Calculate sensible MW->Node timeout once deployed from Tech (deprioritized tickets) to Backlog on the Wikidata-Termbox-Hike board. Pablo-WMDE moved T220404: Calculate sensible MW->Node timeout once deployed from Backlog to Tech (deprioritized tickets) on the Wikidata-Termbox-Hike board. Pablo-WMDE added a comment to T216987: Allow editing of fields. Pablo-WMDE updated the task description for T221219: Style individual alias elements. Pablo-WMDE updated the task description for T218690: Show each alias in a separate line in edit mode. Pablo-WMDE added a comment to T218690: Show each alias in a separate line in edit mode. Pablo-WMDE created T221219: Style individual alias elements. please find a screenshot of what chrome does by default in case of a sneak peek into alias editing. The aliases component has a blue border (as defined) because it has "focus within", the individual alias has the chrome default outline because it has actual focus. So far the individual alias focus style is not explicitly modeled. I advocate to a) explicitly model it [i.e. not leave it up to the browser] b) when modeling it to please consider the previous link. Pablo-WMDE claimed T220980: [4h spike] Research how to implement entity rollback on cancel. Pablo-WMDE moved T220980: [4h spike] Research how to implement entity rollback on cancel from To Do to Doing on the Wikidata-Termbox-Iteration-13 board. Pablo-WMDE placed T220970: Upload Cross Asset or determine use of a font cross up for grabs. Pablo-WMDE moved T220970: Upload Cross Asset or determine use of a font cross from Doing to To Do on the Wikidata-Termbox-Iteration-13 board. Pablo-WMDE claimed T220970: Upload Cross Asset or determine use of a font cross. Pablo-WMDE moved T220970: Upload Cross Asset or determine use of a font cross from To Do to Doing on the Wikidata-Termbox-Iteration-13 board. Pablo-WMDE updated the task description for T220995: Cross domain api requests mobile beta. Pablo-WMDE added a comment to T220375: Vue warn: client-side rendered virtual DOM not matching server-rendered content. @Jakob_WMDE you mentioned that you (quickly?) looked into this. If what I wrote makes sense then please feel free to move this task to done as there is no patch strictly connected to it - https://gerrit.wikimedia.org/r/503285 was created as bycatch but it is by no means representative of what the title of this ticket is about. Pablo-WMDE added a parent task for T220995: Cross domain api requests mobile beta: T216987: Allow editing of fields. Pablo-WMDE added a subtask for T216987: Allow editing of fields: T220995: Cross domain api requests mobile beta. Pablo-WMDE created T220995: Cross domain api requests mobile beta. Pablo-WMDE edited projects for T215951: Cancel edit mode to return to reading mode, added: Wikidata-Termbox-Iteration-13; removed Wikidata-Termbox-Hike. Pablo-WMDE moved T220384: AliasesEdit: Make it appear in MonolingualFingerprintView from Doing to Done on the Wikidata-Termbox-Iteration-13 board. Pablo-WMDE moved T220392: AliasesEdit component: implement UI-only behavior from Peer Review to Done on the Wikidata-Termbox-Iteration-13 board. one more question about the individual alias input element - given that the focus (blue border) is illustrated "one level up" from the individual alias (on the aliases), should the individual alias really not signal focus at all beyond containing the cursor? Outline comes to mind which, in some browsers (see chrome), is used with e.g. an orange color by default - depending on which browser they use, people may or may not be accustomed to it. Pablo-WMDE removed a subtask for T216987: Allow editing of fields: T220498: Vertical alignment of (read-only) language and editable term fields. Pablo-WMDE removed a parent task for T220498: Vertical alignment of (read-only) language and editable term fields: T216987: Allow editing of fields. Pablo-WMDE moved T216987: Allow editing of fields from To Do to Test (Product Review) on the Wikidata-Termbox-Iteration-13 board. Tried it on beta, looks ok given the feature set we expect to be in per the AC. Latest edits on Q11 were actually done using termbox. Pablo-WMDE moved T220375: Vue warn: client-side rendered virtual DOM not matching server-rendered content from Doing to Peer Review on the Wikidata-Termbox-Iteration-13 board. The answer is: it's by design and not a problem. Using a v-show instead would avoid it but also cause significantly more mark-up sent through SSR without any added benefit and potentially causing other problems (we tried that before and TermTextField struggeled to resizeTextField() on initially hidden textareas, i.e. when first opened the textareas were all tiny). Pablo-WMDE moved T220688: EntityInitializer: Error in integration with wikibase (via Client EntityRepository) from Peer Review to Done on the Wikidata-Termbox-Iteration-13 board. Pablo-WMDE updated the task description for T220701: Timebox dev unhappy path collection. Pablo-WMDE moved T220701: Timebox dev unhappy path collection from Backlog to Ready for pickup on the Wikidata-Termbox-Hike board. Pablo-WMDE moved T220688: EntityInitializer: Error in integration with wikibase (via Client EntityRepository) from Doing to Peer Review on the Wikidata-Termbox-Iteration-13 board. Pablo-WMDE claimed T220688: EntityInitializer: Error in integration with wikibase (via Client EntityRepository). Pablo-WMDE moved T220688: EntityInitializer: Error in integration with wikibase (via Client EntityRepository) from To Do to Doing on the Wikidata-Termbox-Iteration-13 board. Pablo-WMDE updated the task description for T220688: EntityInitializer: Error in integration with wikibase (via Client EntityRepository). Pablo-WMDE created T220688: EntityInitializer: Error in integration with wikibase (via Client EntityRepository). Pablo-WMDE committed rEWLEfc5fd2f82208: RecentChanges: run jobs before trying to assert (authored by Pablo-WMDE). Pablo-WMDE assigned T220392: AliasesEdit component: implement UI-only behavior to Tarrow. Pablo-WMDE moved T220392: AliasesEdit component: implement UI-only behavior from To Do to Doing on the Wikidata-Termbox-Iteration-13 board. Pablo-WMDE claimed T220375: Vue warn: client-side rendered virtual DOM not matching server-rendered content. Pablo-WMDE moved T220379: Commiting changes in languages not yet part of the store from Peer Review to Done on the Wikidata-Termbox-Iteration-13 board. Pablo-WMDE created T220686: Ensure test mutations only perform reactivity-friendly changes. Pablo-WMDE updated the task description for T220375: Vue warn: client-side rendered virtual DOM not matching server-rendered content. Pablo-WMDE moved T220374: Add hover colour to publish and save from Peer Review to Done on the Wikidata-Termbox-Iteration-13 board. Pablo-WMDE committed rEWLE96d855bb79dc: RecentChanges: run jobs before trying to assert (authored by Pablo-WMDE). Pablo-WMDE added a comment to T220393: AliasesEdit: styling. Pablo-WMDE moved T220185: let term fields grow to initial value height from Doing to Done on the Wikidata-Termbox-Iteration-13 board. Pablo-WMDE added a comment to T220379: Commiting changes in languages not yet part of the store. @Matthias_Geisler_WMDE said: "if you need more than one line you are doing it wrong", i.e. either 1 Vue.set() to add an individual property or 1 use of the spread operator to add a bunch of them. Pablo-WMDE moved T220183: prevent newlines in term fields from Peer Review to Done on the Wikidata-Termbox-Iteration-13 board. Pablo-WMDE added a comment to T220183: prevent newlines in term fields. Thanks, @Hanna_Petruschat_WMDE - fixed the description accordingly. Pablo-WMDE updated the task description for T220183: prevent newlines in term fields. @Hanna_Petruschat_WMDE Thank you for the very precise task definition. One question to be sure: the current wikidata termbox does not replace newlines with "a space" but with an empty string. Is this change in behavior intended? Pablo-WMDE moved T220183: prevent newlines in term fields from Doing to Peer Review on the Wikidata-Termbox-Iteration-13 board. Pablo-WMDE added a comment to T220373: Add placeholders to empty labels, descriptions, and aliases in editmode. This was originally created as a subtask of T216987 but it turned out there is a dedicated story for addressing these challenges: T217000 - so it became a task of that, ready to be picked along with it. Pablo-WMDE edited projects for T220373: Add placeholders to empty labels, descriptions, and aliases in editmode, added: Wikidata-Termbox-Hike; removed Wikidata-Termbox-Iteration-13, Wikidata-Termbox-Iteration-11. Pablo-WMDE added a comment to T220185: let term fields grow to initial value height. @Jakob_WMDE Adding overflow: auto ensures that scroll bars are not shown - while, by default, they are visible for reasons. Pablo-WMDE created T220498: Vertical alignment of (read-only) language and editable term fields. Pablo-WMDE updated the task description for T220396: Label, Description textarea focus styling. Pablo-WMDE created T220396: Label, Description textarea focus styling. Pablo-WMDE added a comment to T217000: Show placeholders for label, description and alias. We just happened to find this again, realizing that placeholders are indeed not a task inside of T216987. Are we sure this is in the right place in "in preparation"? Pablo-WMDE edited parent tasks for T220373: Add placeholders to empty labels, descriptions, and aliases in editmode, added: T217000: Show placeholders for label, description and alias; removed: T216987: Allow editing of fields. Pablo-WMDE removed a subtask for T216987: Allow editing of fields: T220373: Add placeholders to empty labels, descriptions, and aliases in editmode. Pablo-WMDE added a subtask for T217000: Show placeholders for label, description and alias: T220373: Add placeholders to empty labels, descriptions, and aliases in editmode. Pablo-WMDE updated the task description for T216987: Allow editing of fields. Pablo-WMDE updated the task description for T220379: Commiting changes in languages not yet part of the store. 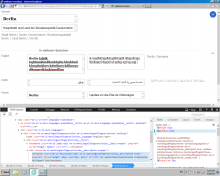 Pablo-WMDE created T220379: Commiting changes in languages not yet part of the store. Pablo-WMDE created T220375: Vue warn: client-side rendered virtual DOM not matching server-rendered content. 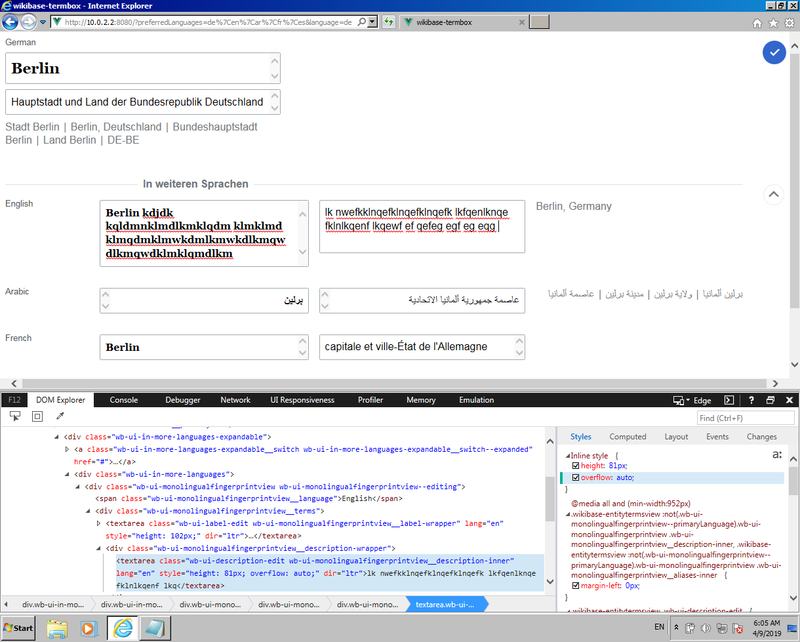 Pablo-WMDE created T220363: Reuse wikimedia-ui-base styles. Pablo-WMDE closed T216720: Research: floating button [1*4h], a subtask of T205608: Floating button to collapse „All entered languages“, as Resolved. Pablo-WMDE closed T216720: Research: floating button [1*4h] as Resolved. Pablo-WMDE closed T209961: node SSR - mediawiki (wb) HTTP request follow-up [2*2h] as Resolved. Pablo-WMDE closed T209961: node SSR - mediawiki (wb) HTTP request follow-up [2*2h], a subtask of T214902: Show mobile termbox on Wikidata test wiki, as Resolved. Pablo-WMDE closed T217568: Fix JS editability data source as Resolved. Pablo-WMDE closed T215793: Show user-specific termbox result for users with non-default configuration, a subtask of T214679: Caching Termbox output on the Wikibase side, as Resolved. Pablo-WMDE closed T215793: Show user-specific termbox result for users with non-default configuration as Resolved. Pablo-WMDE closed T218344: Termbox SSR beta deployment stale as Resolved. Pablo-WMDE closed T215784: wikibase: add revision parameter to termbox requests as Resolved. Pablo-WMDE closed T215784: wikibase: add revision parameter to termbox requests, a subtask of T210615: View historic revisions of entities, as Resolved. Pablo-WMDE closed T215786: termbox: take revision parameter into account as Resolved. Pablo-WMDE closed T215786: termbox: take revision parameter into account, a subtask of T215784: wikibase: add revision parameter to termbox requests, as Resolved. Pablo-WMDE closed T218111: Respect user specified languages in CSR as Resolved. Pablo-WMDE closed T215494: Make all page actions fit new (less high) id header as Resolved. Pablo-WMDE closed T218573: Add the publish button as Resolved.